Motorbikes allow us to reach places where cars cannot go! 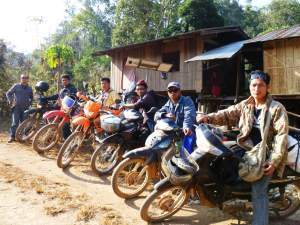 Motorbike riding had become a part of my everyday life in Thailand. I had taken for granted the two lane, paved roads and easy access to repair shops in Chiang Mai. 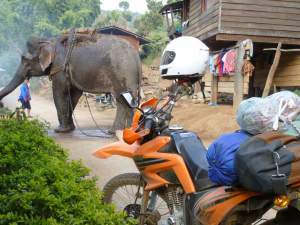 It wasn't until my first trip to the Karen Sgaw of Mae Kong Sai, where elephants are still used to drag logs that I discovered how different riding a motorbike in the city was from riding in the mountains: one slip and down the mountainside I'd go. 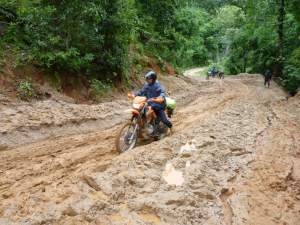 We'd already stopped once to lift up one of our team members and his motorbike out of the glutinous, red mud. Strapped down with backpacks, distribution materials and layers of clothing to knock off the chill, didn't help matters. I learnt to shift my weight through the ruts and sharp curves, without losing speed. My life and the life of my team members driving in front and behind me depended on mastering this art. I was grateful for the prayers on our behalf at the GRN office before our team of five left the city. Only months before we'd received the generous donation of three new motorbikes from supporters in the USA and Australia. Now we were on our way up the mountains of Amphur Chiang Dao and Mae Chaem. Many times up the trail I wanted to stop and take in the vistas-beautiful, green mountains before me; the fresh, clean air; the vastness of God's creation. Instead, my eyes stayed fixed on the trail, arms firm and straight, fingers tightly gripped. Momentarily, I imagined all the fingers around the world tapping computer keys or clasping iphones: communicating fast and easy, from the comfort of home. Yet, here we were risking our lives to visit a people where the Internet, or even an automobile, could not reach. I thought of the times I'd watched by candlelight the responses of those hearing for the first time the Good News of Jesus Christ in their heart language via the Saber player. Nothing was more fulfilling than that. Whatever the risks, they were worth it. With my vision renewed, I continued to tackle each turn of the tough terrain towards the Karen Sgaw. Like most mountain people of Thailand, the Karen Sgaw work hard, long hours and prefer telling and listening to stories, rather than reading or writing about them. They are an oral people by tradition and enjoy listening while they work together. This is why they waited with great expectation for our arrival. Though we were tired and dirty, the villagers greeted us with bright smiles, handshakes and the Karen greeting "Tableu" (which also means "thank you"). They served us a special meal of rice, chicken mixed with lemon grass, mint and hot peppers; delicious! We shared about GRNT's work and vision with the Christian leaders. That night villagers listened to the Good News in the Karen Sgaw language on the Saber player. We worshiped and prayed together, distributed CDs, Bibles and tracks; toys and clothes to the children; medical supplies and eye-glasses. In all, we visited with Karen Sgaw from five surrounding villages. "... here we were risking our lives to visit a people where the Internet or even an automobile could not reach." It's hard to say who was blessed more-the Karen Sgaw or the MGT team. With gladness, we accepted their invitation to come back and celebrate Christmas with them. Their gratefulness and hospitality were overwhelming. We were thankful to God, who was faithful to help us return back home safely and unharmed. That, we count as a miracle.